Starstuff Clothing uses sublimation printing to dye high quality images right into shirt fabric, giving dye a science fiction makeover to create stunning new t-shirt designs. Robbinsdale, MN,, United States of America - - February 24, 2014 /MarketersMedia/ — As the saying goes, humans are all made of Starstuff. Perhaps that is why humans find images of the galaxies beyond us so fascinating, seeing into a world beyond the imagination that surrounds the planet and contains the galaxy. The idea of putting these images on a t-shirt is certainly a novel one, and achieving it has taken a scientifically advanced new dyeing method to achieve. 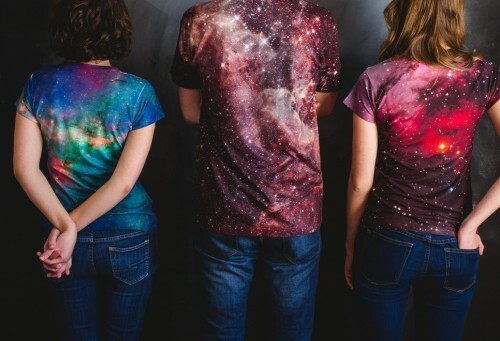 Starstuff Clothing have mastered this technique and offers t-shirts featuring galaxies and nebulae dyed into the polyester, unlike any other t-shirt printing service. This is achieved by sublimation printing, which uses a printed sheet containing the high definition image which is then pressed to the fabric, where the ink is absorbed to replicate the image on the sheet. Unlike typical t-shirt printing, the design of the galaxy shirts covers the entire shirt and never chips away or wears off. There are currently three designs of galaxy shirt available, with the Carina Nebula, the Milky Way and the Tarantula Nebula to choose from. The results are truly hard to argue with, and the site hosts high quality image galleries to showcase the high definition results. Starstuff Clothing is an ecommerce site selling high-quality fashionable t-shirts. The shirts are printed with unique sublimation printing, which produces vibrant and colorful prints by dyeing the fabric, producing a smooth print that will never crack or peel. The shirts all feature actual images of space taken with powerful telescopes rendered in high definition.